Explore the fascinating world beneath the waves as you spend the day with this admission to SeaWorld San Diego. Go nose-to-nose with a joyful dolphin, belly up with a gentle beluga whale or waddle along near the sociable penguins. It’s a park that’s both fun and educational, making every encounter a new journey of discovery. Choose to upgrade your ticket with access to Aquatica San Diego, SeaWorld’s brand new waterpark or an all-day dining package! Make spirits bright at this favorite family Christmas event, every day at SeaWorld this season. SeaWorld’s Christmas Celebration is a holiday waiting to be made, with seasonal shopping, festive food and drinks, and stunning live shows. As holiday music fills the air, a sea of lighted trees sparkles, transforming the park into a wintery, watery wonderland. Celebrate the reason for the season during a mesmerizing nativity show, O Wondrous Night, inspired by the original story of Christmas. Visit Santa's Christmas Village to see Santa himself, meet Rudolph the Red-Nosed Reindeer™ and friends, and savor holiday flavors as you shop for unique gifts and decorations. 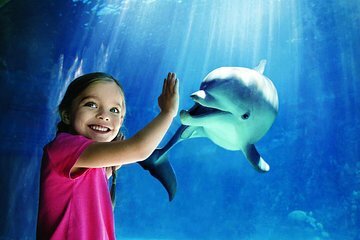 Take trip beneath the waves as you spend the day with the friendly marine life at Sea World San Diego. This one-day admission pass gives you access to the park’s endless range of marine animal exhibits, fun rides and entertaining shows. It's the perfect family-friendly mix of education, entertainment and fun. What will you explore first? Your options inside are nearly endless. Get mesmerized as you watch the park’s bottlenose dolphins and pilot whales in a high-energy performance, filled with hilarious moments. Or get up close and personal with the marine life along the California coast, thanks to this interactive look inside a California tide pool. Check out Shark Encounter to watch these magnificent fish glide through the water, or hop aboard a adrenaline-fueled fun-ride like Shipwreck Rapids or the Wild Arctic Ride. There's also plenty of kid friendly attractions, like Sesame Street Bay of Play. The choice is up to you. Experience killer whales like never before at Orca Encounter. Witness natural behaviors up close; gain a deeper appreciation of orcas as you learn about their hunting techniques, complex communication codes, the role of family and the importance of play. 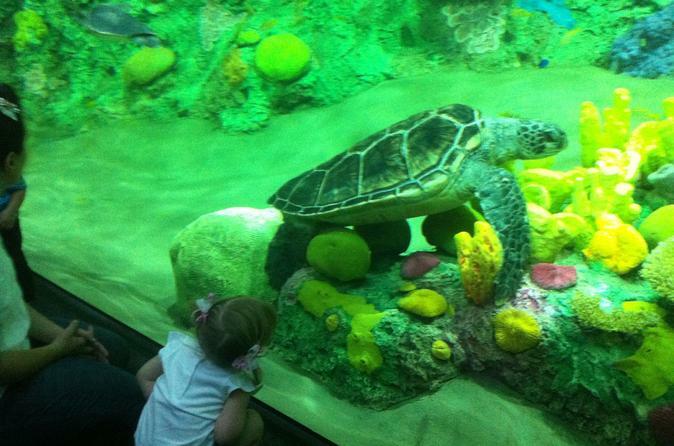 Taje a ride on Ocean Explorer: The youngest explorers can dive into a whole new realm. Featuring five new children’s rides and three new animal encounters to help unlock the ocean’s deepest mysteries! See Itinerary below for descriptions of select SeaWorld attractions.Ticket upgrades can include admission to Aquatica San Diego, SeaWorld's water park, or an all-day dining package! • Turtle Reef - Dive into a world of magnificent Sea Turtles without getting wet! • Sesame Street Bay of Play - Treat your kids to two-acres of childhood magic with their favorite characters from Sesame Street®. • Pacific Point - Have fun getting to know seals and sea lions that reside here, maybe even feed them! • Elmo's Flying FishPlease note: Attractions, shows and rides subject to change. World is also an animal rescue facility not just an entertainment venue. Perfect day, weather, and a happy, wonderful time! Totally hassle free, we even went back and visited twice. Family of 4 spent most of the day at SeaWorld, enjoying rides, shows! Enjoyed it very much. Had to exchange the voucher at the box office but that was not a problem. Very good and affordable theme park. Lot's of fun for kids! Amazing, if you go on a warm day remember your sun hats and sun cream, it gets very hot and there is not a lot of shade!